Year of appearance: 12th century. In India, one of the most remote and isolated structures is Phuktal monastery. This isolated Buddhist monastery was founded in the 12th century, it was built on the slope of the high stone cliff. At first glance it may seem that the construction can be broken down at any time, in fact, the monastery has existed for over 800 years, and it is now home to about 70 monks. To reach the monastery, you can only walk for a secret mountain path, to find that a man unprepared will be almost impossible. One of the main features of the architectural complex is situated above it a natural cave, which is also interesting to visit and hides many secrets. Up until the mid-19th century, the monastery remained secret, in 1826 he was visited by the famous Orientalist of Hungary Sandor Csoma de Koros. The researcher spent in the monastery for over a year, learning the language and customs of the monks, it can be considered a «pioneer» amazing sights. Despite the fact that now the monastery is open to tourists, it has not lost its identity. Travellers will be able to stroll along the stone corridors of an ancient monastery, admire the frescoes adorning the walls, and visit the monastery located in the old library. 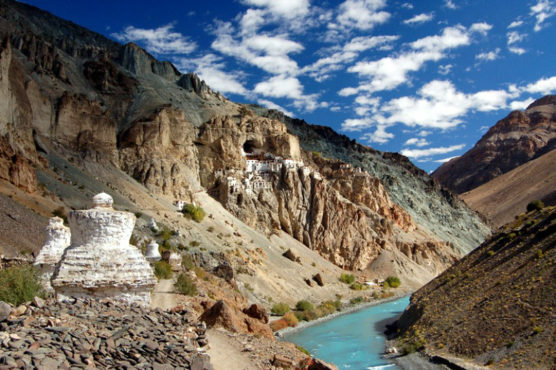 It is important to bear in mind that the road to the monastery is not easy and starts over many kilometers away from the cliff. Usually, in order to overcome a long way to tour takes about two days, during the campaign they will have the opportunity to visit several picturesque Indian villages.